Concerns are growing about the spread of flu in students across Florida. 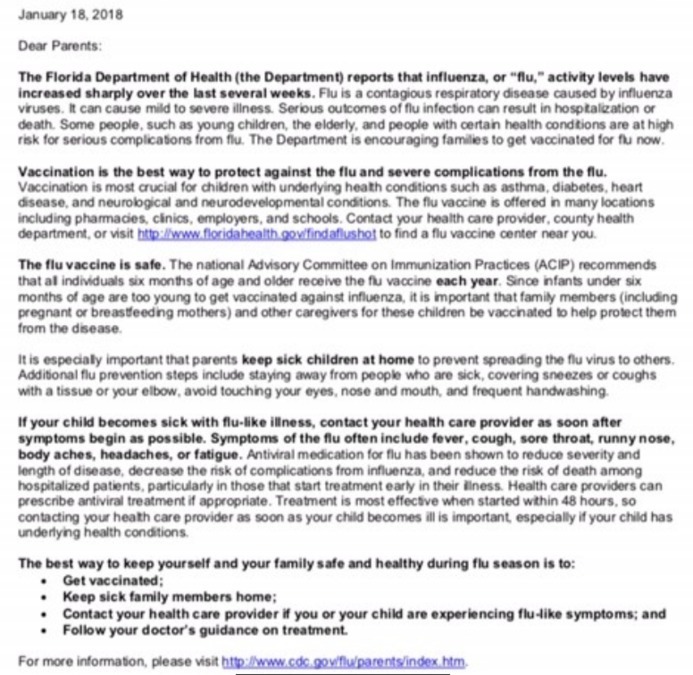 Hillsborough County Schools will be sending out a letter encouraging parents to have their kids get the flu shot after the county asked them to warn parents of the outbreak. The Florida Department of Health (the Department) reports that influenza, or “flu,” activity levels have increased sharply over the last several weeks, the letter reads. Some people, such as young children, the elderly, and people with certain health conditions are at high risk for serious complications from flu. The Department is encouraging families to get vaccinated for flu now, the letter says. While the district's Student Health Services department says they are seeing the normal number of flu symptoms in our schools, Hillsborough County School nurses estimate that around three percent of the district's student population is dealing with flu or cold-like symptoms. This comes after Michael Messanger, a 12-year-old boy from Michigan, died after showing flu-like symptoms, but a negative flu test. The Centers for Disease Control now says the five-minute, rapid flu test is effective only about half of the time. An Orlando man, Joe Morrison, also recently died of flu. Doctors still encourage everyone to get their flu shot. It's not as effective this year, doctors said, but it can lessen the severity of symptoms.